Sarongs are the perfect piece of clothing for the Spring and Summer, easily transforming from a scarf to beach wrap or skirt to evening dress. Grab one now from Combat Flip Flops, a company dedicated to building a sustainable economy in Afghanistan, and get 15% off. Use promo code Sarongs15. For each sarong sold Combat Flip Flops and the manufacturer (Boumi), donate the necessary funds to put a Afghan woman in secondary school for one week. The founders of Combat Flip Flops, two former Army Rangers, realized during their multiple deployments to Afghanistan that the most effective way to fight war is to create better job opportunities for those in areas of conflict. Jobs that can offer a higher income and a safer work environment, as well as teach real skills, naturally draw workers in. Read the full story here and see how this idea has become a weapon for change. Get yourself a light and versatile sarong, which is the perfect travel and summer accessory. 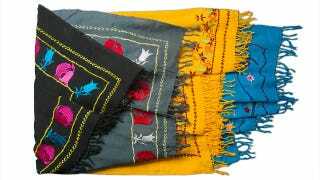 Save 15% and get one for just $60 while supporting women's education and job opportunities in Afghanistan. Use promo code Sarongs15.